In this section, you'll be presented with the steps involved in configuring OSPF over various physical network types. In addition, you will learn the commands to verify OSPF configurations. After you have learned the material in this section, the following labs will allow you to get some hands-on practice using these concepts. Create an OSPF routing process. Specify the range of IP addresses to be associated with the routing process, and assign area IDs to be associated with that range of IP addresses. 1. router ospf process-id Enable OSPF routing, placing you in router configuration mode. 2. network address wildcard-mask area area-id Define an interface on which OSPF runs and define the area ID for that interface. The OSPF process ID is a numerical value that is local to the router. It does not have to match any process IDs that might be running on other routers. It is possible to run more than one process on the same router. However, this will create multiple databases and cause more overhead on the router. The wildcard mask in the network command allows a user to configure multiple interfaces into the same area with a single configuration line. The wildcard mask is an inverse mask and is used the same as an inverse mask with access lists. The area ID is the area in which the interface(s) will be configured. It can be an integer 0 to 4294967295 or it can take the form of a dotted decimal number such as 0.0.0.0. In above example, the router ospf 7 command enables OSPF on Router_D. The first network command enables OSPF on interface Ethernet 0 and puts it in area 0. The second network statement enables OSPF on interface serial 0 and puts it in area 51. All interfaces with an IP address of 100.100.x.x will be placed into area 0; therefore, the second network area command is never applied. As mentioned before, OSPF exchanges Hello packets on each OSPF-enabled segment. This is a form of keepalives as well as a method for neighbor discovery and DR/BDR election. The rate at which OSPF sends the hello packets out is called the "Hello Interval." The amount of time an OSPF router will wait for a hello packet before declaring the neighbor down is called the "Dead Interval." 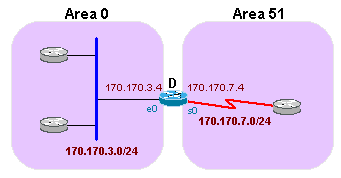 OSPF requires that these intervals be the same between two neighbors; otherwise the two routers will not become OSPF neighbors. ip ospf hello-interval seconds Specify the length of time between the hello packets that the Cisco IOS® software sends on an OSPF interface. ip ospf dead-interval seconds Set the number of seconds that a device's hello packets must not have been seen before its neighbors declare the OSPF router down. ip ospf priority number Set priority to help determine the OSPF-designated router for a network. If the ospf priority on the interface is set to 0, then the router can never become the DR or BDR for that network segment. ip ospf cost cost Explicitly specify the cost of sending a packet on an OSPF interface. As mentioned above, OSPF classifies networks as being broadcast, NBMA, or point-to-point. When configuring OSPF over NBMA networks, special care should be taken. Most NBMA networks, such as Frame Relay, are partially meshed networks and the physical topology does not provide the multi-access connectivity that OSPF assumes is there. The selection of DR becomes a very important issue because the DR and BDR have to have physical connectivity to all the neighboring routers. The neighbor command is used to give the DR/BDR a static list of all other routers attached to the network. This is needed because of the lack of broadcast capabilities. Configure a router interconnecting to nonbroadcast networks. In the above command, the IP address and priority are values given to the neighbor. The poll interval is the amount of time a NBMA interface will wait before sending a hello to a presumably dead neighbor. Note that after the release of Cisco IOS 10.0, the neighbor command is not necessary. There are other ways of running OSPF over NBMA networks that are much more efficient. The use of subinterfaces is a way to split a physical interface into multiple logical interfaces. Each subinterface can be defined as point-to-point. A point-to-point subinterface has the properties of any physical point-to-point interface. As far as OSPF is concerned, an adjacency is always formed over a point-to-point network without electing a DR or BDR. One drawback of point-to-point subinterfaces is that each point-to-point segment requires its own subnet. The following is an example of configuring point-to-point subinterfaces with OSPF. In the topology below, the serial 2 interface of Router_F can be logically split into two point-to-point subinterfaces. Each subinterface is assigned an address out of a unique subnet. Router_G and Router_H also have a subinterface configured. Configure the OSPF network type for a specified interface. Each network type that can be configured with the above command will be explained below. A point-to-multipoint interface is defined as a numbered point-to-point interface that has multiple neighbors. Users do not have to worry about having a subnet for each point-to-point link, and the "NBMA cloud" could be configured as one subnet. Since the links are still considered point-to-point, the user would not have to worry about the election of DR and BDR. Point-to-multipoint exchanges additional link-state updates that contain descriptions of the connectivity to the neighboring routers, resulting in host routes for all the neighbors. Following are excerpts from the configurations of Router_F and Router_G in the above topology. Because of these host routes, Router_G will not need a Frame Relay map statement for Router_H, and Router_H will not need one for Router_G. Setting the interface type to broadcast will logically set the interface to be a broadcast interface, and it will behave as if the router were connected to a LAN or broadcast network. DR and BDR election will take place, so if there is not a full mesh topology, care must be taken about which router will become the DR. Use of the OSPF priority command should be considered if necessary. It can also be seen that Router_H is the BDR from the output above. This may not be desirable since Router_H and Router_G do not have Frame Relay link between them. Router_G and Router_H could be prevented from becoming either DR or BDR by setting their interface priority to zero. 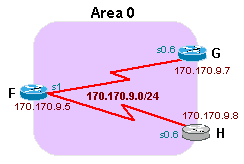 Inter-area route summarization is done on ABRs and accounts for only routes within the OSPF domain. It does not account for external routes. area area-id range address mask Specify an address range for which a single route will be advertised. In the above command, area-id is the area containing the networks to be summarized. In the above topology, Area 51 contains networks 172.16.128.0/24 through 172.16.159.0/24. summary-address address mask Specify an address and mask that covers redistributed routes, so only one summary route is advertised. As mentioned previously, stub areas are areas into which external LSAs are not flooded. Routing to these areas to the external networks is done based on the default route. An extension to stub areas is totally stubby areas. A totally stubby area is an area that blocks external routes and summary routes (inter-area routes) from being flooded. Only intra-area routes and the default route are injected into the area. area area-id stub [no-summary] Define an area to be a stub area. The keyword no-summary in the above command defines the area as a totally stubby area. If the keyword is not used, the area is just a stub area. In the topology above, Router_A is redistributing routes 172.16.128.0/24–172.16.159.0/24 into OSPF. If we configured area 1 as a stub area, routers in area 1 would not learn about these networks. Instead, routers in area 1 would get a default route. 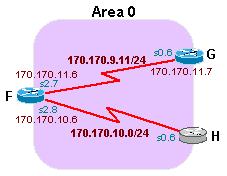 The following is a show ip route from Router_F; note that a default route has been injected, but the external routes are not in the routing table. 2U01  ! -- totaly stubby areas don't see any routes from outside their area. area area-id nssa [no-redistribution] [default-information-originate] Define an area to be NSSA. In the above topology, area 51 is an NSSA area. Router_A is redistributing static routes into area 51. Router_A should send them to Router_B as type 7 LSAs (NSSA external LSA) and Router_B should translate the type 7 LSAs (NSSA external LSA) into type 5 LSAs (AS external LSA) and flood them to the rest of the network. The OSPF database of Router_B shows that there are also type 5 LSAs (AS external LSA). Router_D and Router_F would see only the type 5 LSAs (AS external LSA). ip ospf demand-circuit Configure OSPF on an on-demand circuit. External routes are to destinations outside of the OSPF AS. When an external route is redistributed into OSPF, it must be assigned a metric that is compatible with OSPF. This is the responsibility of the ASBR, which can assign an OSPF metric to the external route. The ASBR is also responsible for categorizing the external route as either external type 1 (E1) or external type 2 (E2). The difference between the two is the way the metric of the route is calculated when determining shortest path. The cost of a an E2 route is always the external cost, irrespective of the internal cost. The cost of an E1 route is the sum of the internal and external costs. E1 routes are always preferred over E2 routes. In the above topology, if the two ASBRs (Router_F and Router_C) are injecting external route 10.10.10.0/24 as E1 routes, Router_E would see the cost to 10.10.10.0/24 as 20 (5 + 10 + 5) through Router_C. The E1 cost through Router_F, as seen by Router_E, would be 30 (20 + 5 + 5). Therefore, the path through Router_C would be preferred. If the ASBRs were injecting the route as E2 routes, the Router_E cost to the network through Router_C would be 15 (10 + 5). The Router_E cost to the network through Router_F would be 10 (5 + 5). Therefore, the path through Router_F would be preferred. If the external costs to the destination network are equal as in the above topology, and the external routes are injected as E2 routes, then the path selected as the best path would be the path with the lowest cost to the ASBR. In the above topology the external costs are equal (10), so Router_E will select the path through Router_C because its cost through Router_C is 5, versus the cost to Router_F, which is 20.
redistribute protocol [process-id] [metric metric-value] [metric-type type-value] [subnets] This command redistributes routes from one routing domain into OSPF. default-information originate [always] [metric metric-value] [metric-type type-value] [route-map map-name] Force the AS boundary router to generate a default route into the OSPF routing domain. The "always" keyword will force the ASBR to advertise a default route, whether or not it has a default route in its routing table. Without the "always" keyword the ASBR will advertise a default route only if it has one. The "metric" and "metric-type" are the cost and type (E1/E2) assigned to the default route. The "route-map" can specify a set of conditions that need to be met before the default route will be advertised. You have now learned the fundamentals of configuring OSPF. Now, you can gain hands-on experience by configuring OSPF in the OSPF Configuration Labs and use your troubleshooting knowledge in the OSPF Challenge Labs. Now proceed with the OSPF Lab Project.